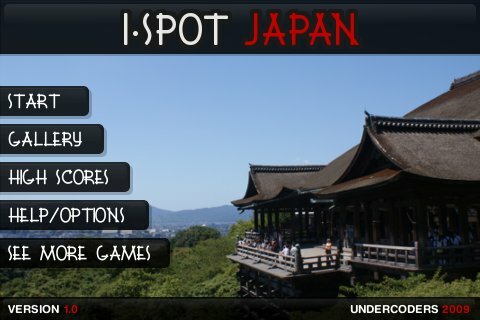 i-Spot Japan by Undercodes is great little spot the differences game which will test you as well as take you on a journey across Japan as you get to explore its beautiful locations. i-Spot Japan is currently available for the Apple iPhone / iPod Touch and the initial download is absolutely FREE !! The complete release of i-Spott Japan will contain a total of 200 locations, divided in 3 levels of difficulty ranging from easy, normal and hard. 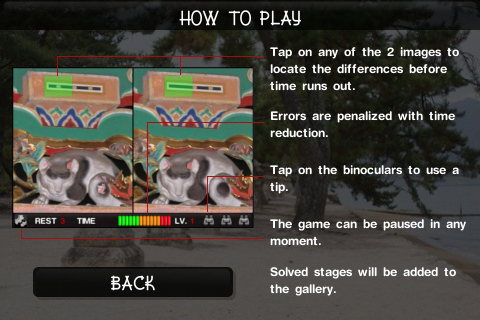 Every location features 3,4 or 5 spot the differences, depending on the level of difficulty you have selected. For example playing it on easy will have you finding only 3 differences compared to 5 when playing it on hard. Some of the differences are VERY hard to spot where some are looking straight at you and are impossible to miss. 30 locations will be available for free as an initial pack when downloading the game (10 per level), the rest will be DLC as an in-app purchase. This is is great as you can play the game for free and if you like it you can purchase the rest of the locations as you go. All locations within the game are accompanied by a title, a detailed description and its location showing its whereabouts on the map. All this information, together with the original pictures can be viewed in gallery mode once that location has been unlocked during the game. This is great for learning little facts and culture on Japan. All images illustrate a wide selection of historical monuments, shrines, temples, castles, food and even lifestyle faces plus more, images span from southern island of Kyushuu to the northern island Hokkaido, Fukuoka, Nagasaki, Matsue, Hiroshima, Tokyo, Kyoto, Sendai, Matsue, Aomori, Sapporo these are just a few of the cities portrayed in the game. i-Spot also features an online leaderboards which enables players compete for the best times and scores. As this is review is also accompanied by a video review click on the play button below and watch the game and the review in action. i-Spot Japan is a great for anyone that enjoys spot the difference games, Japanese culture and history. A few things that could be improved is the Map section in the gallery and possibly have a more selection of background music. For a Free download with the option to purchase the remaining packs for only $1.99 i-Spot Japan is worth trying out and great for the whole family.